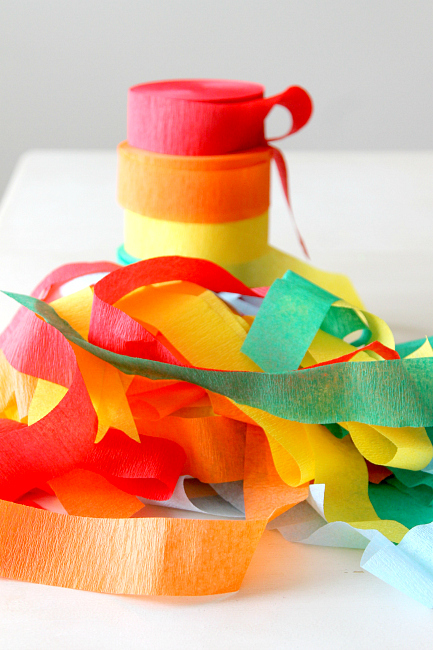 Every time we have a party we dress the dining room up with the strings of crepe paper and always have rolls of it left over. 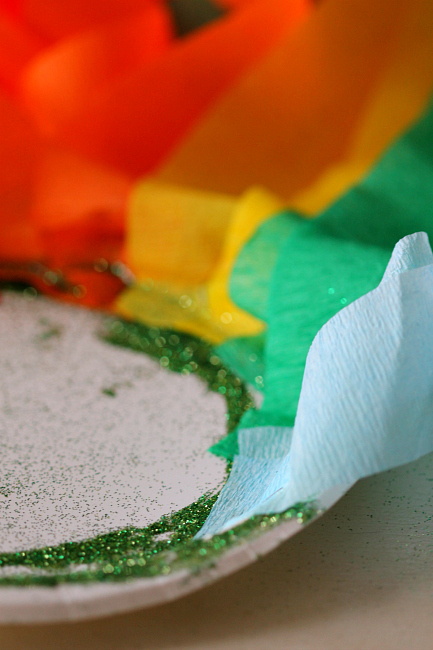 Its cheap and its fun but there has to be more to crepe paper than birthdays, right? 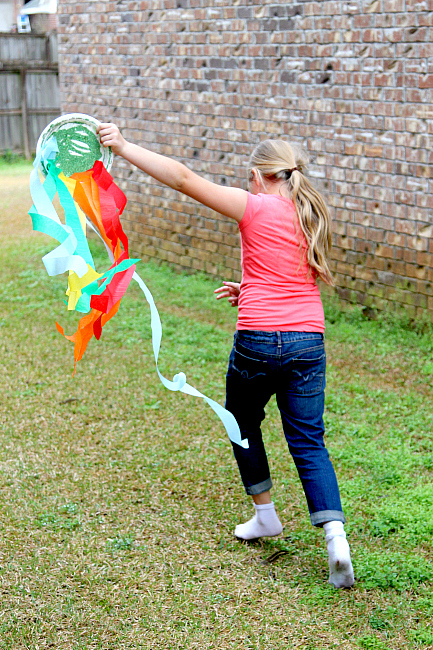 So in or question for all things Rainbow Crafting this month, we created a fun “wind sock” ( I realize its not a sock, but we call this ‘creative license’). The kids worked together on it very well! This craft also resulted in some serious glitter around the house, but it did make sure I mopped for about 10 days straight so I suppose this was a win/win. Decorate your plate! I let the kids each have a plate. They glued it up with a glue stick and then covered in green glitter. You could cut the middle out of the plate if you want it to be easier to hold, but we left it hole because my son is only 2 and it was easier to dump the glitter. Staple your crepe paper all around the paper plate. We made a “rainbow” with ours, but you can do any color scheme you would like! We precut our pieces and I did the stapling for everyone myself. All done! It was really easy and the kids ran all around the house playing with the “wind sock”. I had Charlotte show it outside so you can see how fun this is! Its always the little simple projects that end up being the best. This project would also be fun for a group of kids at a party or picnic. 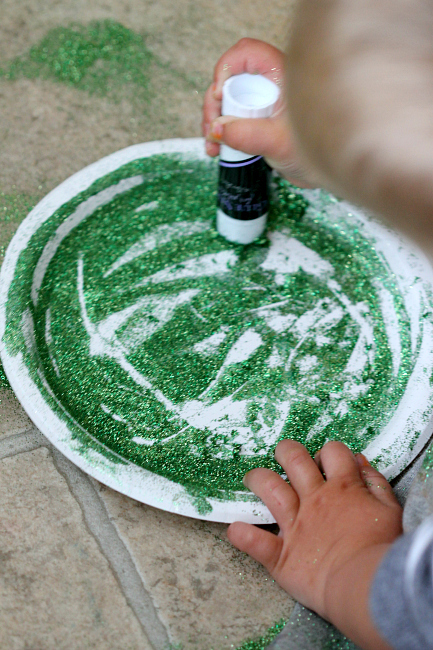 « St. Patricks Day Crafts: Make a Blarney Stone! This is an adorable idea. I love that you added the colorful rainbow tails. This is so simple, yet my 4 year old would think I am the queen of awesome if we did this! Great idea! How fun! I bet the kids loved making this! Did P get to run around with it too? What a great idea! I’d never think to make this. I love that it’s easy and gets the kids up and moving. That’s so cute! My kids would have fun with this one! I love this idea. SO easy and so fun. Thanks! How adorable is this? I love that kids can do it by themselves too. When did Charlotte grow up? She looks like such a young lady. She’s pretty. I bet the kids had a blast with this. I’m going to send this link to my friend who is a Girl Scout Troop leader. It’s a great craft to make with the girls. That’s cute and easy. Could make a really sweet indoor “wind chime” with it too. Looks like a very fun Patty’s Day craft. Thanks for the idea. 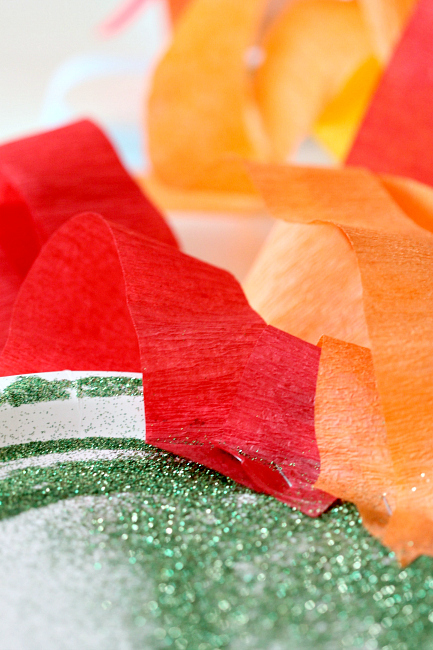 This looks like such a fun St. Patrick’s Day craft! There’s glitter involved so my kids are in! What a perfect Spring time or St. Patrick’s Day craft. Totally pinning this for future reference! This looks like so much fun! Will definitely have to try this something soon! Love the tutorial and gorgeous photos as always. I’m loving all of your easy rainbow crafts. I bet your kids love it when you craft. This looks like a lot of fun for my little one! 🙂 Thanks for sharing! What a cute idea. And simple enough for the kiddos to make. Love it. I remember making these in daycare as a kid. Think it’s time to bring it back old school for the kids and have some fun. Thanks for the reminder. This is perfect for kids! It gives them the feel of a kite, but so much more doable! It still amazes me the things you come up with to do LOL So cute. This is cute & totally just gave me an idea what to do with some old crafting stuff I’ve had lying around for eternity. This looks like such a fun craft! We will be celebrating St. Patrick’s Day in my house so I think we might make it this weekend!